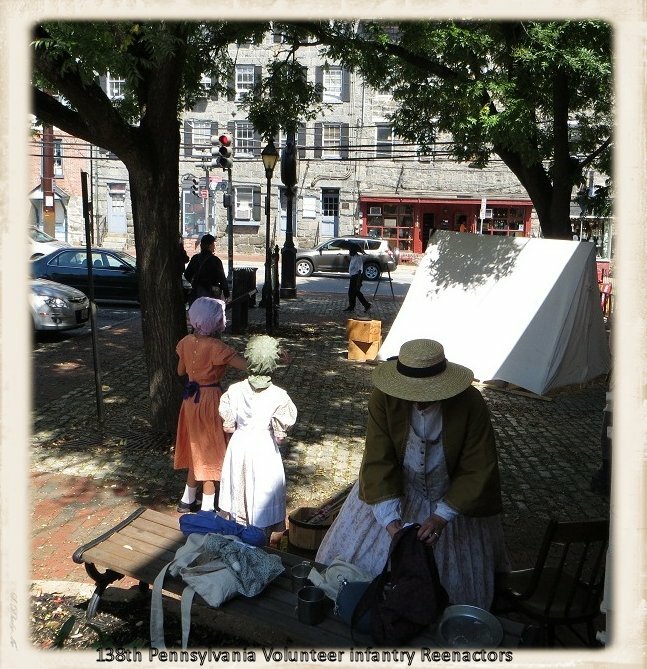 The Ellicott City, Maryland train station –now out-of-commission and part of the Baltimore and Ohio Railroad Museum – had Civil War reenactors camped out in front of it over the weekend. It’s the 150th anniversary of the start of the Civil War, and many of the museums in our area are taking part in ongoing commemorative activities. 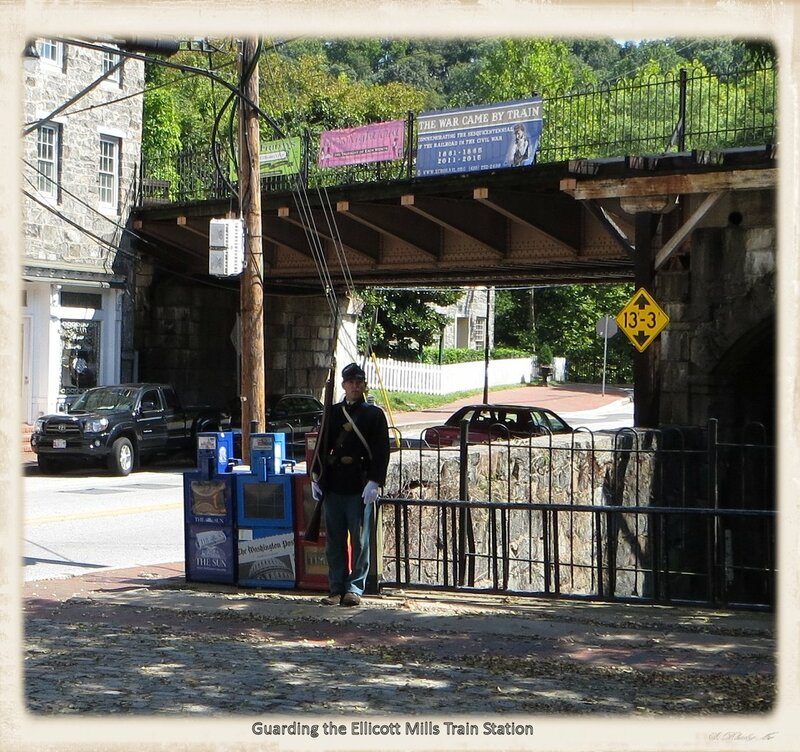 The reenactors represented the 138th Pennsylvania Volunteer Infantry Company B, which actually did guard the Ellicott City train station during the Civil War. Transportation was a critical piece of the war effort and the 138th – Companies A through K — was tasked with guarding the Baltimore and Ohio railway line around Relay, Maryland. Relay was the location of the junction that led trains from north and west into Washington DC. Company B was quartered in Ellicott City, then called Ellicott Mills. 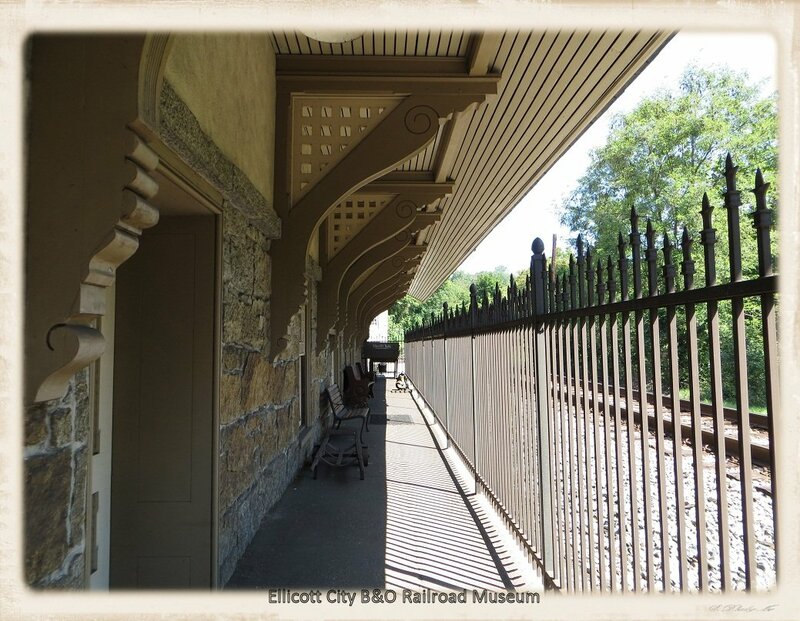 The tract from Baltimore to Ellicott City was the first 13 miles laid in the US and the Ellicott City station, built in 1830/31, is America’s oldest surviving train station. It’s built of the local granite that lines the river, the Patapsco, which flows through town. I was at the museum early on Saturday morning and there was no other visitor in sight as I started wandering through. The station was built on the side of a hill, and downstairs was the freight agent’s living quarters. Upstairs was where passengers got the train. 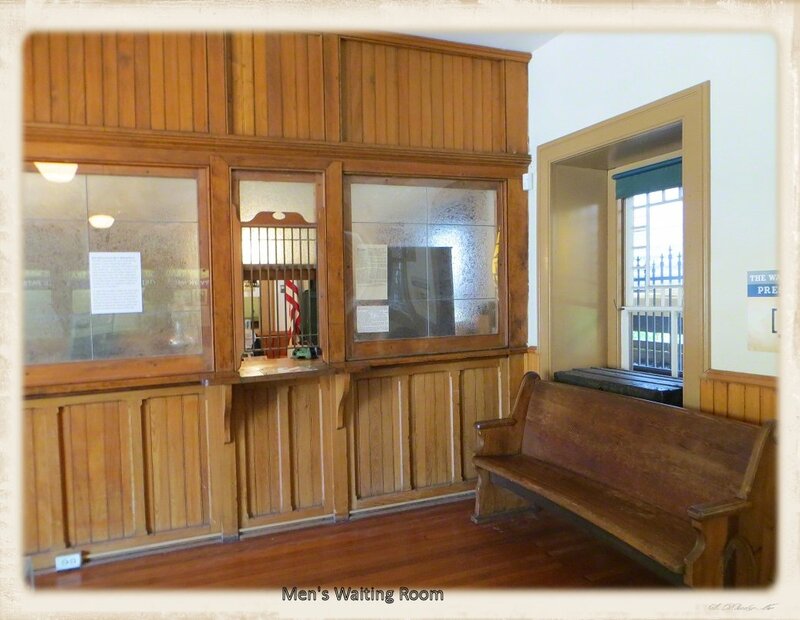 There was a telegraph/ticket office, a men’s waiting room, and an office/women’s waiting room. Women and children entered, bought their tickets, and waited in a space separate from the men until the late 1930s (I’m a little freaked out that that’s only a few decades before I was born). Doors led from the men’s waiting room to the tracks, where there happened to be a modern freight train rolling by. I was wrong about the museum being empty. There were two toddlers, carried by their fathers, watching the train. 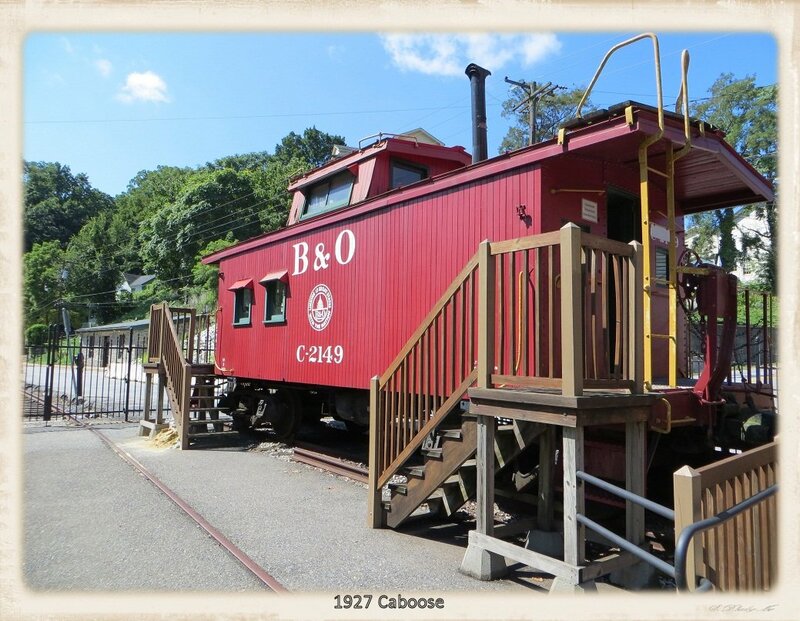 I slipped by them to see a 1927 caboose and an 1885 freight house at the far end of the station. 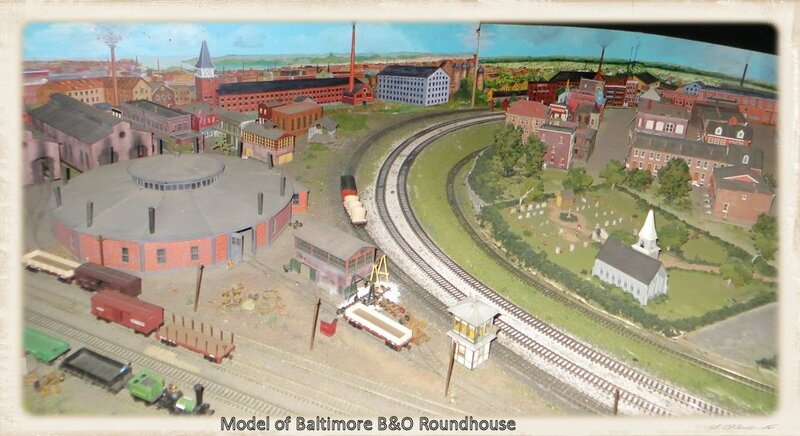 The freight house was filled by a model train set showing the original 13 mile B&O train line from the Baltimore station to the Ellicott City. I was mesmerized by the huge model train set-up built by volunteers, and probably could have stood there most of the day, watching the trains go round and round. There was a docent in the room to provide information about the model and about the B&O. I spent as much time in the model train room as I did in the rest of the museum combined, and even then, the entire trip through didn’t last more than 20 minutes. There was only one way in and out, so I had to weave my way back through the museum to leave. And as I passed through each room again, I found that since I’d been through the first time, they’d been populated with costumed interpreters. 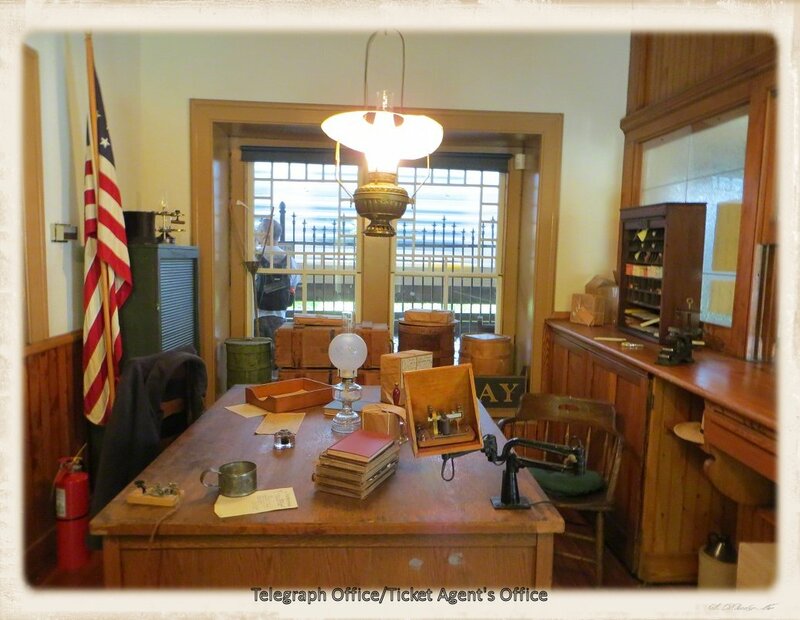 The telegraph office had a man dressed as a ticket agent and in the freight agent’s living quarter was his wife. He didn’t look up as I passed through, but she stopped me and asked if I had any questions. I didn’t have questions but I’m always on the look-out for some interesting tidbit that I can include in the blog. So…what can you tell me about this room? 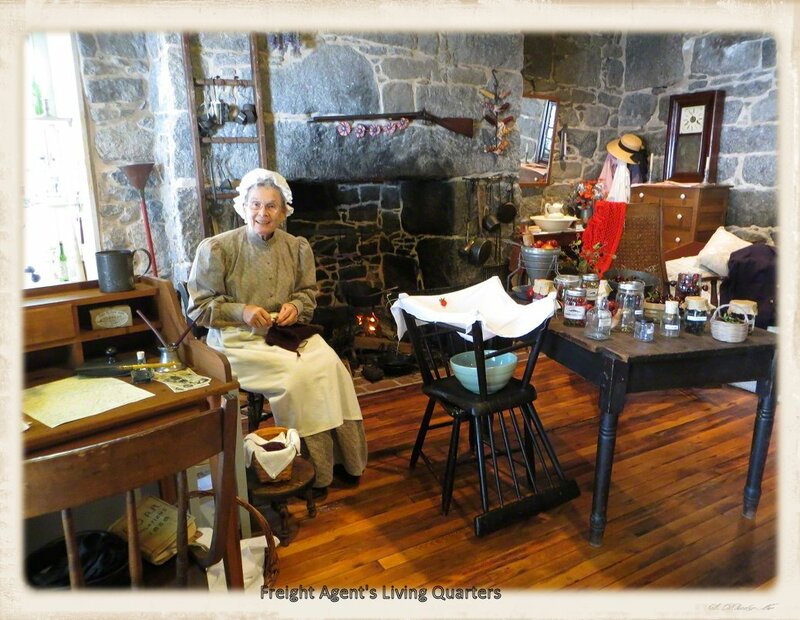 The freight agent’s apartment originally was a freight holding area, but was turned into living quarters in the 1840. 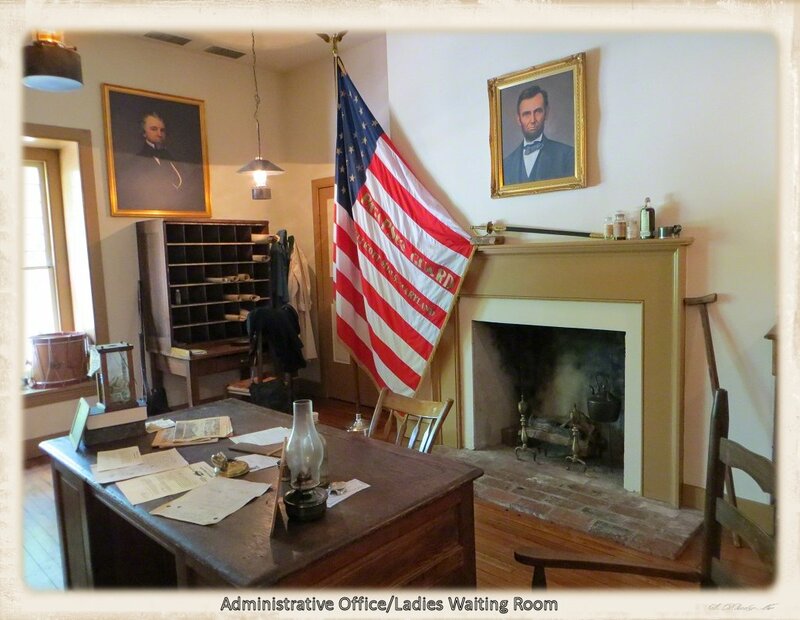 The agent during the Civil War had a wife and two children who lived with him in the one room. 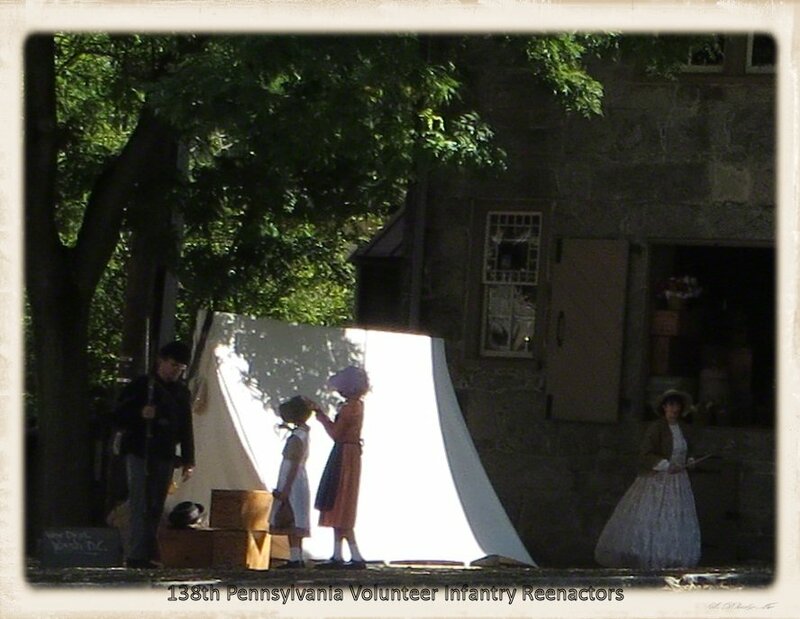 Outside, Company B of the 183rd Pennsylvania had set up camp. They’d been recruited in 1862 from Adams County where, coincidentally, Gettysburg is located. The 183rd wasn’t involved in the battle at Gettysburg, but they were stationed at Harper’s Ferry when it happened, and gave chase to Lee’s troops as they fled south after the battle. The 183rd later would be engaged in battles in Virginia. I passed through camp to take a look at the elevated train tracks and noticed a signed posted on its fence. It was an ad for the museum. “The War Came by Train,” it said. I thought it might make a good post title, so went to take its picture. Because if I don’t have a picture, or I don’t write it down, I forget. That’s when I noticed the young man in a Union private’s uniform standing at attention below the tracks. Many of the original Company B recruits had been students from Pennsylvania College of Gettysburg (now Gettysburg College). As he noticed me taking a picture, he turned to me and smiled, sweetly, in a very un-modern teenager way. Those who know me will tell you that I’m one of the least fanciful and sentimental people around. But for a second, the cars and other 21st century sights and sounds disappeared, and all I saw was a too-young soldier going off to war. I guess that’s what reenacting is all about. A sad post script: a train carrying coal derailed last night as it passed the museum and went onto the bridge. Two 19-year-old college students, who were sitting on the bridge, were killed. Main Street and several of the businesses on that end of town are closed. The museum will be closed until at least Friday. 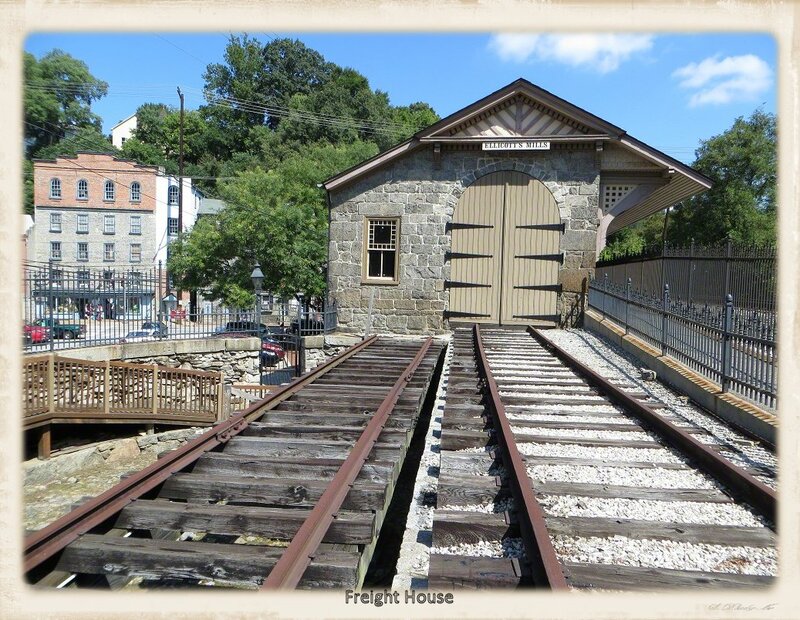 Gallery | This entry was posted in Maryland and tagged 183rd Pennsylvania, B&O Railroad Museum, Ellicott City, Ellicott Mills, history travel, living museum, Maryland, museum, train, train museum. Bookmark the permalink. I think that would have been a really interesting visit. So why didn’t you use that as the title for the post though?